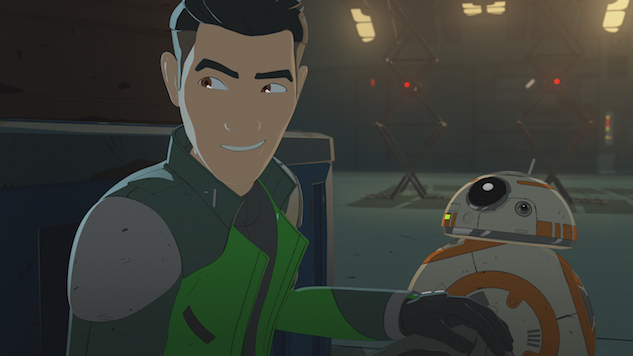 Star Wars Resistance, Disney’s newest offering on the animated Star Wars altar, opens with a visual gag that even the most casual fans of the franchise will get a kick out of. No spoilers here, but in the few seconds it takes for that gag to resolve, the personality of the newest addition to the greater Star Wars landscape, both stylistically and narratively, is made clear: Deeply saturated but flatly lit, Wookieepedia-fluent but unapologetically irreverent, this is a series that will be concerned primarily with having fun. This is lucky, as the recent waves of “fandamentalist” conversation around Star Wars as a franchise have been decidedly un-fun, and the recent cinematic and serial additions to the Star Wars canon have leaned more aggressively into the universe’s darker and more fan-servicey corners. To have something like Star Wars Resistance added to the mix, with its tight cast of mostly new, mostly extra-political characters, and with what amounts to a chaotically inhabited “gas station in the middle of nowhere; serving as the base of operations for thrill-seeking sky racers and other assorted troublemakers from all across the galaxy, is a relief. Star Wars may have gotten better as a pop culture property as its has deepened the complexity of its universe, but not every addition to that universe needs to be an epic of nuanced political, moral and space-magic intrigue. Sometimes, it can just be about a hotshot kid who wants to prove himself as an ace pilot, and his new metaphor-intolerant alien friend who wants to make that dream come true. Which is, of course, exactly what Star Wars Resistance is: the story of almost-ace pilot Kazuda Xiono (Christopher Sean), whose accidental run-in with Poe Dameron (guest voice Oscar Isaac) in a dogfight with a First Order pilot lands the newbie on the aforementioned proto-gas station, the Colossus, as a newly minted Resistance spy meant to infiltrate its thrill-junkie ace pilot community and work out who might be friendly with the rising threat of the First Order. Once on the Colossus, Kaz teams up with a green tentacly dude named Neeku (Josh Brener), as well as Jarek Yeager (Scott Lawrence), a gruff old human pilot pal of Poe’s, and his young human mechanic, Tam Ryvora (Suzie McGrath). Bobby Moynihan, Donald Faison, Myrna Velasco, and Jim Rash are among the rest of the regular voice cast, while Adam Driver and Gwendoline Christie are both in line to reprise their film roles as guests, and Elijah Wood is set to guest as a sky racer Kaz meets later in the season. All great actors, all obviously enjoying their work, in a series that lets them play around in a part of the Star Wars sandbox that has long been a visual signature of the franchise—hotshot flying—but which has never been made a story’s singular focus. With only the two-part premiere made available for critics, it’s a challenge to determine how complex Kaz’s spy story will end up being in the long term, but from how jokey/slapsticky these first two episodes are, and how squarely focused on showcasing as many flashy fight and flight scenes as possible, it does not seem like the show is in danger of being taken over by the grimness of spying against a fascist galactic order. That said, even the lightest corners of this particular franchise have taken turns into darkness and complexity, so perhaps it isn’t fair to judge a Star Wars series by its cover, even when its cover is doing such a bang-up job of being bright and unchallenging. Perhaps the spy story will snowball, and the socio-political connections will tangle, and Star Wars Resistance will become a sandbox not just for actors to have fun in the Star Wars universe, but for the universe to deepen in complexity even further. Or not! It might just stay the family-friendly (late-night) sky racing romp that its premiere suggests it is. Frustratingly for Disney, Star Wars Resistance is unlikely to make up the biggest share of Star Wars-related conversation this weekend, given that it debuts so soon after the publication of the Morten Bay’s research uncovering the Russian trolls and bots behind much of the nastiness directed at The Last Jedi and Rian Johnson. And even if SWR does take over the Star Wars news cycle, the series already has its own roiling controversy to deal with: The voice actor behind General Leia Organa, who is also set to make several cameos throughout Kaz’s journey, recently posted a bad-faith tweet mocking Christine Blasey Ford’s voice, and fans have begun demanding that Leia be recast. Given how James Gunn’s old bad Twitter behavior was handled, and how Jeffrey Tambor was pointedly replaced by Keith David as the voice of Glossaryck on Star vs. the Forces of Evil, it seems reasonable to expect that Disney might take those demands into serious consideration, especially as more fans see General Organa’s silent cameo in this week’s premiere and discover the controversy afresh. At the end of the Disney primetime night, though, there is never going to be a Star Wars project that survives controversy-free. So know this: The Star Wars Resistance premiere is a fun watch, and as good a reason as any to tune into Disney late on a Sunday night. Where it goes from there, we’ll just have to wait and see. Star Wars Resistance premieres Sunday, Oct. 7 at 10 p.m. ET on Disney Channel. The one-hour season premiere, along with two additional episodes, will be available on the DisneyNOW app, Disney VOD, and all desktop, mobile, and internet-connected TV devices, beginning Oct. 7 at 12:01 a.m. PT.